This riverfront, cedar log home with nearby lake access offers a view tempting you to fall into your surroundings and to relax. The location of the home is great if you just want to get away from it all or if you are an adventurer seeking white-water rafting, hiking, canoeing, and off-road ATV trails. The two-story, cedar log home offers three bedrooms (two queen-size beds, two twin beds, and a queen-size sleeper sofa), two full baths, and a great room with a rock fireplace, kitchen, and dining room. This three bedroom, two bath home offers a large wrap-around deck for your enjoyment. The log home is situated on approximately 7.5 acres, but is surrounded by hundreds of acres just waiting to be explored by foot, mountain bike, or ATV. Within walking distance you will find our private entrance, with picnic table, to a lake stocked with all kinds of fish including bass, trout, and perch. This tranquil lake has ducks and geese, and is great for canoeing. We have lived 'in the city' all of our lives (Ed lived in New York State, then Tampa, Florida, prior to moving to Miami, Florida and I was born and live in Miami, Florida). Our dream was to find a place in a small, but wonderful, area. We looked in several areas for many years, including Murphy, but didn't find the 'magic place'. We decided to return to Murphy 5 years after our first brief visit. When we drove back in, we knew we were right in coming back. It was a moment that changed our lives. We didn't know it then, but it has. Our son has moved to the area because of the peace and beauty he found here and 3 of our friends are now our neighbors. We have all found something special here. We can't really describe it, but we can certainly feel it! We bought this home because we were looking for 'the perfect place'. We found it! We wanted peace, tranquility and beauty, but it had to feel 'good'. The moment we walked in, we knew we had found everything we had been looking for. Our home is more than a place to stay. We respect the fact that it is, also, a home for wildlife and have tried to maintain a safe haven for the beautiful things nature has provided in this area. Our dock over the river offers a peaceful escape from everything or a chance to catch trout! The lake is quiet and is the morning 'home' to ducks and geese. After a day of hiking, biking, white water rafting, ZIP lining or enjoying watersports on the nearby lake, it truly is a 'home' to return to and unwind. Our home is 'easy'. It is 1 1/2 to 2 hours from several 'big cities', but is in a wonderful 'small town'. There are no 'strangers' in Murphy. We are on 7 1/2 acres in a valley on the Nottely River. Being in our home, sitting on the deck or on our dock on the river makes everything 'right'. Looking around and seeing the natural beauty allows you to put everything in life in perspective. We truly are fortunate to have found this magical place. Everyone who has chosen our home in which to spend their special time agrees. You don't stay in our home, your experience it! Canoe is available for use in our lake. Jon boat is available for use in our lake. Casino - Harrah's Cherokee Valley River Casino is minutes from our home. Excellant vacation - even the rain didn't ruin it!!! We had a great time at the Shulte cabin in Murphy NC. We spoke with Bobbi and got the skinny on where to go eat (not so skiiny now cux' we ate every meal out!) and things to do. 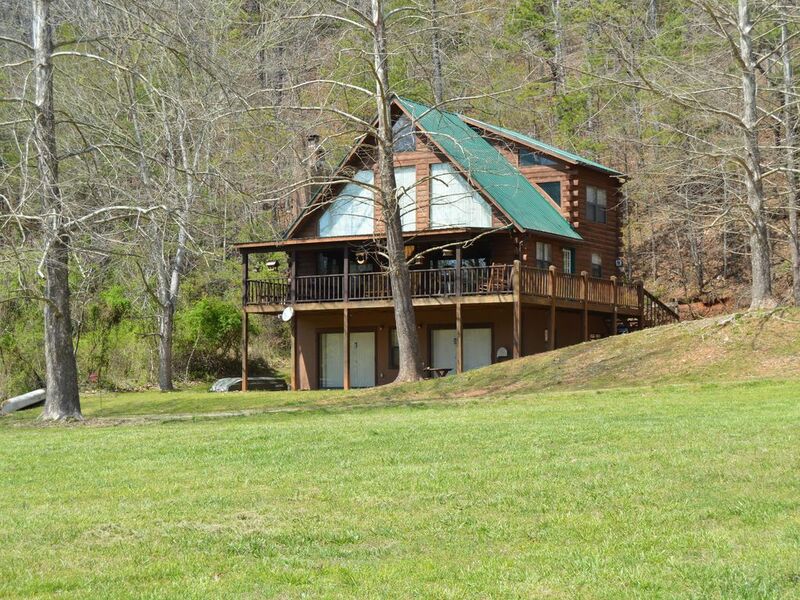 Everyone involoved in the property was excellant and responsive, We are looking forward to a spring fishing trip and the mountains in drier weather. The cabin itself stayed very warm on the cool days we had and everything we needed was there including extra blankets. We didn't get to use the fire pit outisde due to rain but the fireplace was very warming and cozy. We loved it!!! The house was comfortable and clean. Very quite area and my dogs enjoyed the big grass area in front to play and the walks. Very nice cabin, So nice that we are now looking to buy one in the area. Had a great relaxing week, enjoyed the weather and all the wildlife. Would definitely recommend this cabin. I am so happy that you experienced "that feeling" . It is the one that says you have found peace and just need more of it! You will know when you find the perfect place the minute you walk into it. Until you do, you are welcome back anytime! Thank you for putting into words, so beautifully, what we hoped you would feel. We are happy knowing that you enjoyed your time and experienced what you did. Being surrounded by nature always provides beauty and creates tranquility! I am glad you found it while in our home! Family gathering at the river. Family members came from Florida and we came from Michigan for a long weekend. We also have a daughter living at Murphy. We had 4 generations at the cabin. The children had alot of room to run and play. Weather was warm and beautiful. Accommodations for sleeping was very good. Looking forward to the next time we get to spend time together. We loved our stay at this cabin. Peaceful, quiet, relaxing. Enjoyed watching the birds from the porch rocking chairs. Place was clean & cozy. Bobbi was quick to respond to any questions & was very accommodating. It was a pleasure having you in our home! I am so happy that you enjoyed "the entertainment". The birds and squirrels asked that we thank you for being so kind! The fish thank your husband, as well! They were happy not to have been caught! I am glad that you were able to take advantage of what nature has provided. Again, thank you for being so kind! Stacy asked that we let you know how appreciative she is! Our door is open to you always! We had a little problem with the dish TV but fixed it after about two days. The washing machine needs balancing as it makes quite a bit of noise on the spin cycle. The property is very nice. Our dogs loved it. Thank you! I appreciate your kindness and am so glad your dogs got to enjoy the field. I wish we had known about the TV issue. We would have "walked you through" fixing it, immediately, so you could have relaxed in front of it, from your first day in our home, after having a wonderful day in the mountains. Thank you for letting us know about the washing machine. We had it looked at as soon as Stacy let us know. Thank you, again, for being so thoughtful! The Refundable Security Deposit of $150.00 to hold your time is due immediately. The full rent is due 30 days prior to your stay. There is an additional cleaning fee for parties over 4 people and an additional $10.00 cleaning fee for pets and a Refundable Pet Deposit of $150.00. Nightly rates do not include tax and cleaning. Additional fees for over 4 people are $100.00 per adult per week and $50.00 per child per week. Minimum stay for holidays and October is 6 nights. The nightly rate for holidays and October is $100.00, plus tax, cleaning and additional guests. We are happy to quote all inclusive rates prior to booking and welcome all questions regarding our property and rates. Your Security Deposit and rent will be refunded if your booking is canceled 30 days prior to your stay.